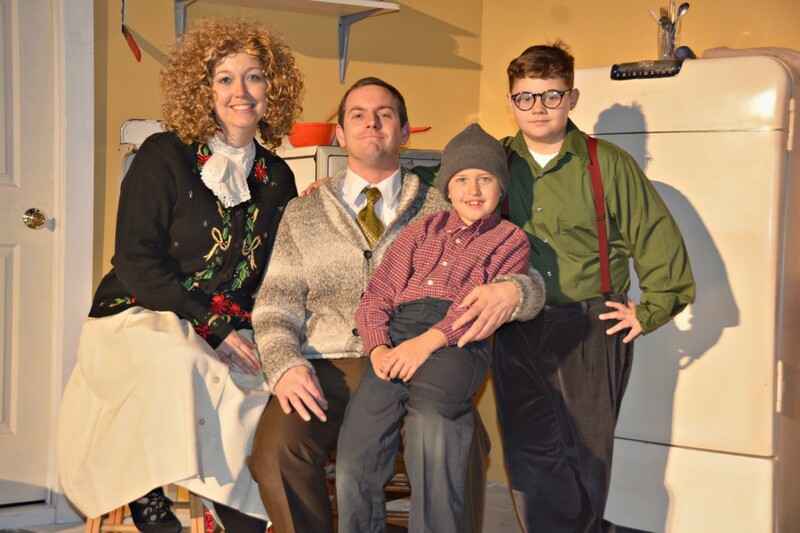 Palestine, Texas- Palestine Community Theatre presents A Christmas Story, the stage version of the classic holiday film based on the stories of Jean Shepherd this Christmas at the Historic Texas Theatre for one weekend only. A cast of 12 local community members have come together to bring this classic American film to life at the Texas under the direction of Dana Goolsby, with assistance from Sandy Webb. The stage of the Texas has been transformed into the house on Cleveland Street in Hohman, Indiana, and all nine-year-old Ralphie wants for Christmas is the legendary official Red Ryder 200-Shot Carbine Action Range Model Air Rifle, with a compass, and this thing which tells time built right in the stock. The problem is that every adult in his life, beginning with his mother, is afraid he’ll shoot his eye out with it. Ralphie’s attempts to persuade Santa and his parents that he should get the Red Ryder BB gun form the basis for this heartwarming and nostalgic look at growing up in a small town in America in 1938. The traditional Opening Night Gala will be held on Thursday, December 11, at 6:30p.m., with the curtain opening at 7:30p.m. Chef Simon Webster of Sabor a Pasion will provide complimentary hors d‘oerves. Complimentary wine, beer and punch will also be available. Chef Webster will also hold a raffle for A Christmas Story themed leg lamp cake before the show, with all proceeds benefitting the theatre. On Friday, December 12, PCT will host an Ugly Christmas Sweater Party, sponsored by Lott-Safford Wealth Management of Tyler, Texas, beginning at 6:30p.m., and the curtain will open at 7:30p.m. Complimentary hors d’oerves, wine, beer and punch will be available before the show. Everyone is encouraged to wear Christmas themed sweaters and join in the fun. Prizes for the best sweaters will be given away before the show. There will also be a rifle for a Red Ryder BB Gun, sponsored by Braly’s Building Supply prior to the show. Saturday, December 13, the show will begin at 7:30p.m., and the final show will take place on Sunday at 2p.m. Tickets to see A Christmas Story can be purchased locally at the Palestine Area Chamber of Commerce, Dogwood Diner, Switch, Sears Hometown Store, and Discount Pools in Elkhart. Tickets can also be purchased online at www.outhousetickets.com. A Christmas Story is sponsored by Mary Alice Largent Century 21 Gold Realty. For more information or questions email Dana Goolsby at historic.texas.theatre@gmail.com. 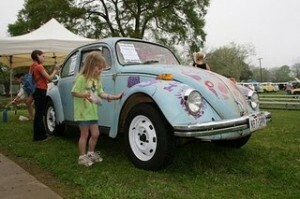 For a list of more events happening during Christmas In Palestine, Texas visit www.visitpalestine.com or download the Palestine, TX app for free on your smart phone. Palestine, Texas – A train ride is just the beginning of holiday traditions in Palestine. Christmas in Palestine will offer plenty of family-friendly fun this holiday season.Special events planned now through Dec. 30, 2014 make this Christmas an ideal time to visit the City of Palestine. The season is filled with family activities, events and decorations that capture the holiday season. 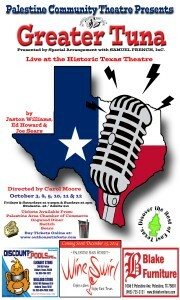 Palestine, Texas- Celebrate Texas at the Historic Texas Theatre this fall with a Texas-size comedy! Palestine Community Theatre, Inc. presents Greater Tuna October 3, 4, 5, 10, 11 and 12. NACOGDOCHES – Soon Azaleas will be blooming all over the oldest town in Texas, and that means a swarm of bugs won’t be far behind! 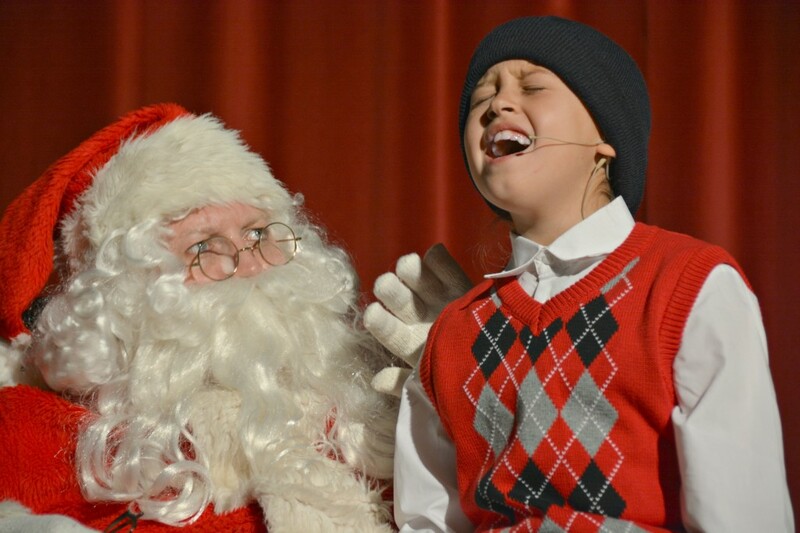 Christmas Shows are Coming to Crockett!